Well this isn't very Christmasy but someone just sent me the link and I find it very disturbing. Perhaps it is a sign of the times. It does indirectly tie in with the Christmas message. It's a video of peaceful protesters being pepper sprayed by police at the University of California in Davis. I cannot articulate how outraged I am. Then a right wing spin doctor media outlet had the audacity to claim the protesters were willing participants in being pepper sprayed. They were holding a sit in. They were sitting peacefully side by side in a political protest that clearly had merit. 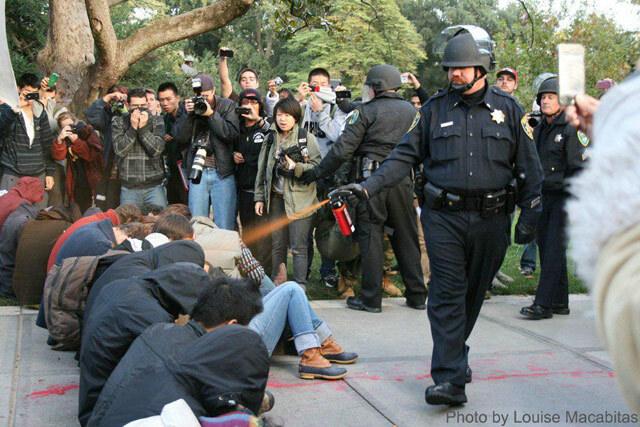 They didn't "want" to be pepper sprayed. You see one girl in particular on the right bow her head and cringe in anticipation of the pepper spray. This was clearly a misuse of the weapon. This graphic talks about how much more dangerous police pepper spray is compared to civilian DOG spray. Let's not forget the 84 year old woman the police pepper sprayed in Seattle exercising her right to lawful assembly. They were told if you don't move we will pepper spray you. 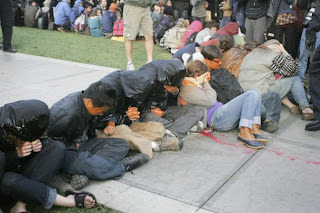 Their refusal to move was not an invitation to be pepper sprayed. It was a claim to their unalienable right to free speech and lawful assembly. Normally in sit ins police will physically pick up a protester and arrest them. The protester doesn't resit nor aide the arrest. It is a nonviolent symbolic gesture. Martin Luther King was a man I greatly respect. Aside from being a great orator, he was a powerful activist. He walked the walk he didn't just talk the talk. He was also the champion of nonviolent civil disobedience. He did not make a public appeal for anarchy. He said when you are committing an act of civil disobedience, you break the unjust law but are willing to face the consequence of breaking that unjust law in an attempt to correct that unjust law. Pepper spraying nonviolent protesters with such a casual disregard for the Bill of Rights is shameful and embarrassing. It diminishes all of us. It reinstills public concerns about the National Defense Authorization Act. Setting up military checkpoints on American soil with no regard for the Bill of Rights or due process is definitely something out of Star Wars alright. This fat POS is gonna lose his job for this, and so he should. For some reason he and SOME other LEO's on both sides of the border DO NOT GET that Tasers and OC spray (never mind impact weapons)ARE NOT tools to enforce "compliance to command" against a subject who is NOT physically resisting. IF they are ACTIVELY resisting, then game on, that's what they are there for. Come on guys, this is pretty simple, Non-compliant passive vs. Non-compliant actively resisting. That's a good point. When I've seen the taser abused it was because the suspect didn't obey their command at the snap of their fingers. The most absurd example I saw was a guy who had taken off his bathing suit at a beach. He wasn't hurting anyone. He just refused to put his pants back on. After tasering him with the electrode type taser he was on his back flailing around like a fish out of water because of the electricity going through his system. One of the officers commanded him to roll over onto his stomach but he was obviously incapable of doing so with so much electricity flowing through his body. The officer freaked that the guy didn't obey his command at the snap of his finger and started tasering him over and over again on his chest. It was absurd. Using tasers or pepper spray on a suspect because they didn't obey their command is wrong. If a protester is burning cars or looting, that's different. In that case pepper spray would be deemed reasonable force. However, if someone is just standing there with a political protest sign or participating in a sit in, the use of pepper spray is wrong. It fails the test of reasonable force simply because the nonviolent protestor isn't using any force against anyone.